Thank you for your interest in falcata plywood from Tumac Lumber. We are one of the first companies in the world to use Nature’s Barcode™ to verify that our falcata plywood core consistently meets the above specifications and legal requirements in the country of harvest and manufacture. All meranti face and back veneers applied to the falcata core plywood come from PT Tanjung Selatan Makmur Jaya and are also verified using Nature's Barcode™. See here for more details. ALL FALCATA TIMBER USED IN THIS PRODUCT IS HARVESTED FROM SMALLHOLDER PLANTATION FARMS IN THE CENTRAL JAVA REGION. 100% of the falcata used to manufacture this product has been verified to come from local smallholder plantations. This industry supports numerous local farmers and communities in the Central Java region. It also means that the timber is coming from planted, rather than natural forest sources. The meranti face and back also come from certified natural forest concessions in Kalimantan (see meranti plywood). 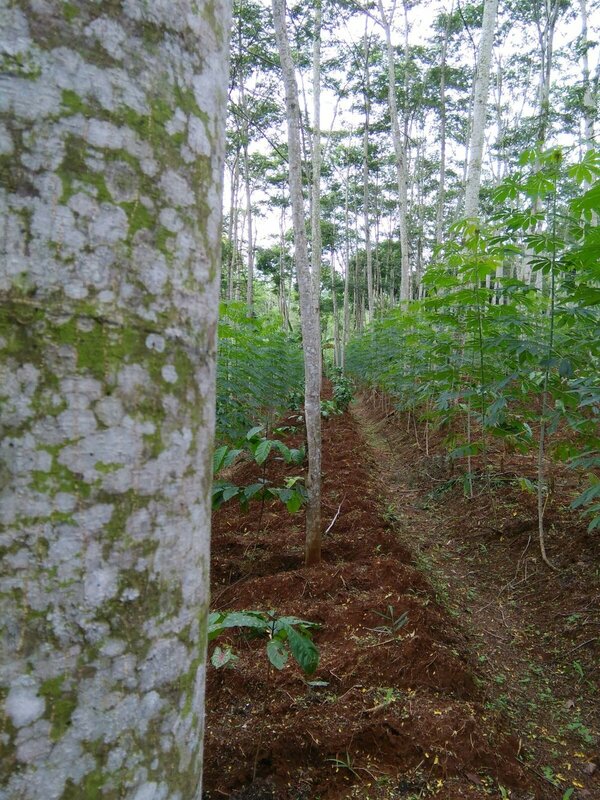 FULL PRODUCT TRACEABILITY BACK TO SMALLHOLDER FARMS MITIGATES RISK OF TIMBER SUBSTITUTION. Having established a good level of record-keeping by the factory and log traders, it is possible to trace all falcata logs back to individual smallholder farms. Ongoing verification ensures that high standards of record-keeping are maintained and any changes in log supply are monitored. This provides comprehensive evidence of legal purchase, trade, transport and processing at every stage of the supply chain, as well as consistent use of the correct species. FALCATA HAS BENEFICIAL PROPERTIES FOR USE AS PLYWOOD CORE. Combining the lightweight falcata core in our plywood product with the superior quality meranti face and back veneers results in a 20% reduction in the overall weight of the product. • supply chain analysis to assess the level of traceability back to log source, and compliance of all entities in the supply chain against Indonesian legal requirements. Random, desk-based document checks are performed on log purchase, transportation, log delivery and product export records. This process maintains confidence that an unbroken chain of custody exists linking product back to log source, and a full set of legality documentation is available for every shipment. • Product "backtrack" to match product output with raw material (logs) input on a randomly selected sample of product bundles. Regular field assessments at randomly selected falcata smallholder farms are conducted to monitor harvest practices and maintain a high standard of record-keeping from smallholder farmers and log traders. Through the use of Nature's Barcode™, a third party verification system, we have adopted a system that demonstrates industry-leading due diligence that aligns with our stated values. For more information about Tumac and our other products, visit our website.